Barry Richardson's 2005 team had begun the season in grand style but as winter wore on, some players inexplicably lost form and injuries began to take their toll. The coach was left scratching his head and wondering where he might find the answers to the team's malaise. One proposed a solution, or at least an experiment. "Play the big kid in the U19s, the one kicking all the goals." The super-coach decided to stick with those he knew well, and the big kid in the U19s finished with 67 goals from 16 games, without a September stage to tread. Richardson's Xavs squeaked into the finals, despite a narrow loss to Trinity at Toorak Park in R17, and a 13 goal drubbing at the same venue at the hands of new flag favourite Uni Blues in R18. A week later, the Red 'n' Blacks ventured to Box Hill and looked down and out against a determined Old Scotch. All looked lost until the machine clicked into a gear it hadn't touched in a month. Their second half capture and torture of the Cardinals is legendary. In his post-match address, Bones called them the Predators. Next week, the Predators narrowly defeated a slick Old Haileybury unit courtesy of some eleventh hour heroics by Damian Lynch. The team was still hunting. Next week, they beat Uni Blues in the Grand Final in an epic. The players had shown the same faith in their coach as he had shown in them. As fate would have it, Old Xavs began the 2006 season at University Oval. AFL veteran Mark Graham played his first game with the club, but was red carded in the final term. Xavs came back very late in the last when John Pasceri sailed one through as the siren sounded, breaking the tie and sealing one of the great comebacks. Earlier in the day, that big kid from the U19s had been given his chance in the Reserves. Given that he had a strong commitment to lawn bowls over the summer and decided on a Bali trip just before the season opener, he was no walk-up start. With a mop of blond hair and plenty of size, he reminded a few of a young Carl Ditterich, though the fiery Saints' ruckman never sported the holiday henna tattoos like this young buck. No-one remembers how and when his first two goals came, but many recall his third, a miracle snap late in the last that seized victory for the visitors. And everyone learned his name . . . Matthew Handley. The next week, Handley was in the Twos again. 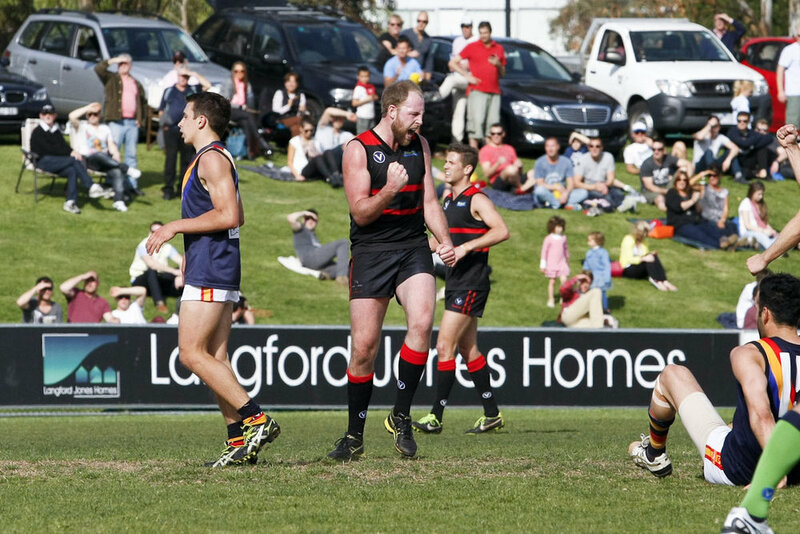 He booted ten, and suddenly, there was clamour for a senior berth. Barry Richardson couldn't squeeze him in, but after the giant added another seven in R3, it was time to test him in stronger company. 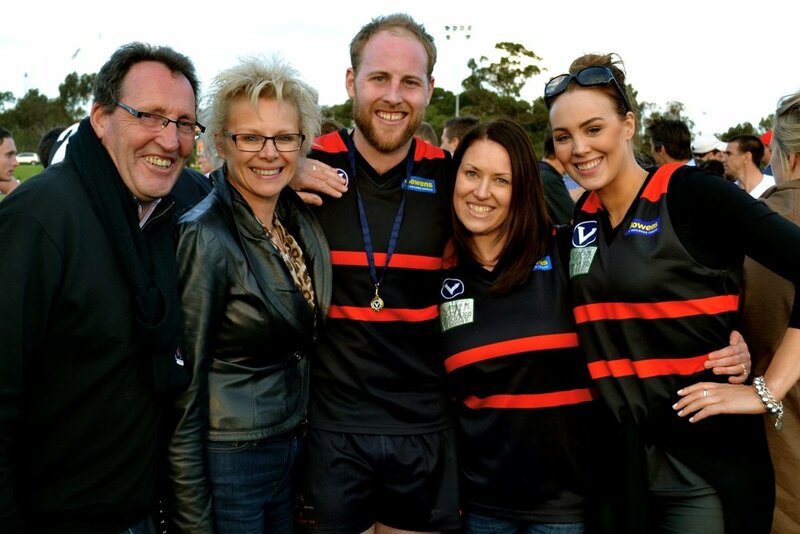 Matthew "Chopper" Handley was chosen for his first senior game, a tilt with Old Melburnians at Toorak Park. 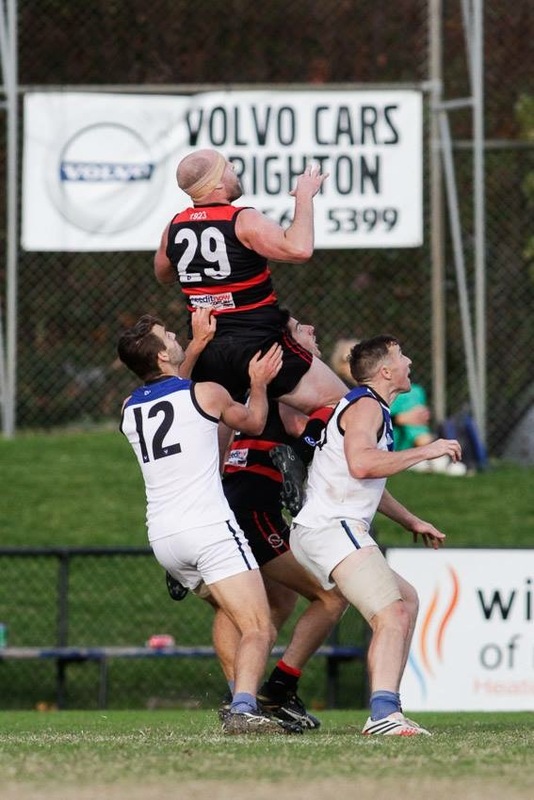 He booted seven, scoring goals with each of his first six kicks and laying a couple of tackles that shook both opponents and the ground itself. The henna adornments faded, but not his form. He followed up with nine, five and eight goals in the next three weeks and by this time, opposition teams were all assigning their strongest, tallest defender to the blond bombshell. Our football memories are strewn with players who promised but never produced. The greatness of Matthew Handley has endured through 13 seasons and 229 games of Premier football. Only club legends David Landrigan and Andrew Dillon have played as many in senior company and lasted as long at the top level of Amateur football. Chopper has also represented the VAFA on 14 occasions and captained the Big V to important victories. He's destroyed defences in Ireland and England. If there is a game on, the big fellow has wanted a piece of it. In recent years, he's spent some time in the ruck. He's long handled stoppages deep in the forward line, and snagged many goals from these clashes, but having been called to roll up the ground and handle a restart in the centre, Chopper has also fired up his teammates with his savage attack on the ball from the middle. Yet his rightful position is at the goalfront. There have been plenty of occasions over the years when opponents have appeared well on top only to have their satisfaction smashed with a brutal bear hug or collision, often followed by a purple patch that delivered late goals. Held and scragged and blocked and pushed by many an opponent, he's never quite received the favourable treatment he deserved from the men in white/lime green, but despite his exuberant and boisterous game style, incurred a red card just once. That day, he took umbrage at the treatment handed out to a teammate and jumped in to even the score. He got his two week's worth, to be sure. Chopper has always adhered to the Teddy Roosevelt method of speaking softly and carrying a big stick. We've all seen him pre-game, earplugs in, listening to someone or something or other, and we've long wondered what. From his very first game, we ruled out Perry Como and Andre Rieu. In a club and in a competition where player turnover is immense, Matthew Handley has been a shining star for a long time. More than that, he has been an inspiration for his teammates with his dedication and application to the task. Yes, he's had a few bad ones, though very few, and his effort and desire for the ball has never been questioned. He's played through injuries and he's come back strong time and again. When he decides to hang them up, Matthew Handley will leave a gaping hole in the goal square. We will miss him greatly, though so many of the opponents he has ripped apart, body and soul, will surely rejoice over his departure. To date, the great man has booted 749 goals in the Red and Black. No-one has done that before, and with game's evolution seemingly forcing the spearhead from stardom, no-one else is likely to do it again. Unless it's his son and heir, Grayson "Chipper" Handley, whom we hope to see in Red 'n' Black in 20 or so years time. So Handley closes out his thirteenth senior season on Saturday. He will approach his 250th with the same passion he embraced his first. And we watching will look on with the same sense of anticipation that we felt when Simon Lethlean hit him lace out back in May 2006. I was fortunate to play with (fleetingly) and coach Chopper at both Old Xavs and for the Big V.
No matter which team it was, Chopper gave his all, invariably excelled, hurt people, inspired performance and significantly impacted on outcomes. He has an amazing record at the Club and in the competition ,and his longevity is a credit to his hard work and dedication. Chopper’s record and feats will be talked about forever in the history of this great club – what an effort and what a player. I love what Chopper has done for this Club. Simply the greatest Old Xav in my time at the club – week in, week out, for over a decade in the hardest position on the ground, Chop has continued to deliver the same ferocious attack on the ball (and anything else in his way), and headaches for opposition coaches. My man-love for Chop is well known. I walked taller when playing with him, and still draw confidence from seeing the big #29 roaming our forward 50 every Saturday arvo. A LEGEND of our club & the VAFA, whose achievements will stand for many years to come. Congratulations Chopper. Chopper burst onto the scene in '06 into an already established team. He immediately began to get hold of older, more experienced defenders kicking big bags consistently, which is a rare feat for a young key forward. I loved playing with him, not only because of his goal kicking prowess or his ability to take strong contested marks. It’s his overall competitiveness for the contest and desire to win that stand out for me. Always being selfless for the team, these traits optimise OX standards and why we achieved great team success. To be still playing 12 years later in the same manner is an absolute credit to his professionalism and commitment to OXFC. Well done Choppy, you’re an OXFC champion on and off! Congratulations Chopper on an amazing 250 Games in the red and black. Your football career and statistics are virtually unrivalled, however, the team and club-first attitude is a lot more impressive. The Club and your teammates have been spoilt throughout the years to have our star forward always being one of the first to commit to the following season and rocking up Day 1 of pre-season with a minimum of fuss, no ego and a genuine want to see the team and others achieve success. It was always a great feeling running out knowing that the big number 29 would accelerate into opponents and crash packs, take a big mark when needed or kick the big important goal at a crucial time of the game. 5 premierships and 750 goals is amazing, and I have no doubt the goal tally would be a lot higher if the umpires realised you were being held, although Ally did quietly point out to them a few times!! A great mate and a credit to your family, you have been an exceptional role model for younger players on the effort and dedication it takes to achieve success at the Old Xavs. Well done to you and the entire Handley family on the impact you all have had and continue to have on our football club. Chopper’s contribution to our club both on and off the field has been extraordinary. For over a decade, our game plan hasn’t changed from: “move the ball quickly to Chopper”. That period has yielded 5 flags and a few near misses. The consistency of your performance is a testament to your work ethic and character. The universal respect you have earned is thoroughly deserved. I hope you and the family have a great day. Congratulations on the 250th. Matt - (Chopper) what a great effort for you and your family. 250 Games & 750 Goals is unbelievable. To play so long and maintain such a high level of performance at the elite Amateur level is a true testament to you. You have always represented your family and our club with integrity and class. You have also helped pioneer our women's teams, and we are all indebted to you as a senior player reaching out to bring success their way more quickly. You can add your tribute in the comments section below. 2006 - 3 Reserves games, 20 goals; 17 Senior games - 62 goals. 21 Senior finals, 51 goals. Feel free to add your tribute in the Comments section below.